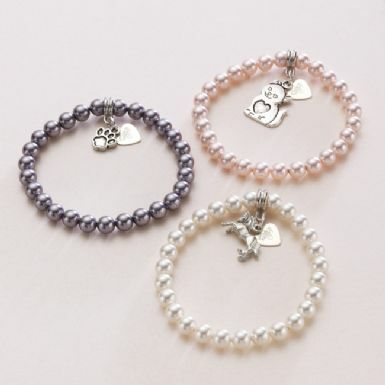 Pet Loss Pearl Bracelet - Made in Memory Tag with Optional Engraving. This engraved gift is made using Swarovski pearls and your choice of charm. In addition to the charm you choose the bracelet features a heart tag engraved on one side with the words 'Made in Memory'. The other side can be engraved with a pets name or any text up to 12 characters. Metal Parts: Pewter charm and bail with Steel engraved tag. Size: small, medium or large available.